The Rockland group at MASC Day 2. Rockland’s Council was given the prestigious Gold Council Award. Each year in March the Massachusetts Association of Student Councils (MASC) sponsors an annual three day conference held in Hyannis, Mass. Rockland started going to the MASC conference with eight students in 2006. This year 20 members attended. Along with the increased participation, Rockland’s SGC has also become a gold council. A gold council means that the council has met 46 out of 50 criteria points. “Gold Council is the highest honor a student council can receive in Massachusetts,” said Mr. Rowe, the advisor for RHS’ student council. Rockland has won three times in a row, making Rockland one of the best student councils in the state. Another activity at the conference is voting for MASC officers for the next school year. Schools from all over the state attend to vote for a select few who run for the positions of Secretary, Vice President and President. Each council gets three votes and decides which candidate to give all or part of them to. This year’s winners were Jared Felix from Taunton for secretary, Shannon Ryan from Marshfield for vice president and Jacqui Manning from Grafton for president. There were three candidates for secretary, six for vice president and seven for president, including Rockland High School’s own Chris Catania. 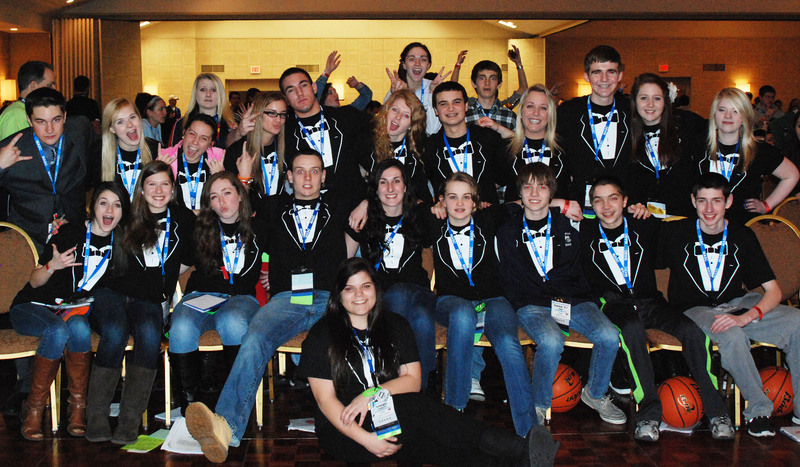 Although no one from Rockland won, everyone still had a great time at the conference. Freshman Lexie Carchedi, who went for her first time, described it as “crazy, fun and life-changing.” Junior Molly Garrity described it as “100% worth going. I loved every minute of it”. The days at MASC are busy. Students wake up at 7 for breakfast, attend workshops where they learn things that they can bring back to their own council to help improve their schools, and how to raise more money. These skills the students in the council have learned are great to bring back to help improve how to run the school’s student government. Later in the day everyone gathers into the main assembly hall and watches and listens to the keynote speakers. The keynote speakers are nationally recognized and always convey something inspirational yet entertaining. The keynote speakers hold students’ attention while they are on stage. The first speaker was Johan Khalilian told his life story but with a funny twist to it. He would tell a story, usually a funny one, and then relate how that changed him and made him who he is today. The second keynote was a pair of men, father and son, who used music to inspire and teach. The father, Monte, and his son, Michael talked about the creative process and how to never give up. The students loved the keynote speakers. Molly Garrity described them as “extremely attractive young men” with interesting and inspiring messages. “It was amazing how one second, myself and everyone else could be laughing so hard our ribs hurt to wiping our teary eyes,” said Lexie Carchedi. Each day ended with some free time. Students could go to a dance or just hang out in their rooms. As MASC came to a close on Friday morning no one wanted it to end; but after being snowed in for three hours, the students were happy to arrive home around 5:30 pm, tired but energized and eager to continue the work of SGC at RHS.